Listen to Drs. 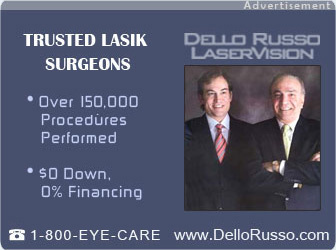 Joseph and Jeffrey Dello Russo discussing the future of LASIK. Information about what kind of laser a lasik procedure uses. Lasik surgeon states that they will only treat the amount of people they can handle. A testimonial for Dr. Robert Maloney. A video that explains how the eye works. A patient recommends another surgery instead of lasik eye surgery.